Two decades ago, consumers could hear live music at concerts, listen on the radio, watch TV, or purchase records, tapes or CDs at a retail music store or mail-order service. Since then the music industry has been turned upside down, and continues to evolve rapidly. Now, the most popular options include downloads from digital stores like iTunes or Amazon, online music and video streaming services, satellite radio and online CD stores. As a result, the revenue stream for performers has fragmented, and artists need attorneys who know how to negotiate for their income and fight for their rights. Miami attorney David Bercuson has centered his legal practice in this challenging entertainment environment. “You have to understand the legal issues in this new age, educate clients and be an effective advocate. Every day is filled with different issues,” says Bercuson, whose office is near Dadeland in south Miami-Dade. 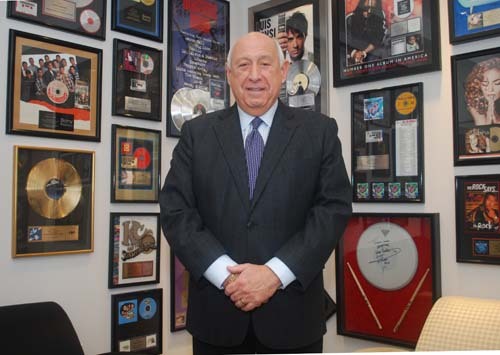 As an entertainment lawyer, Bercuson is regularly invited to concerts and parties, and his office is filled with gold records and memorabilia from clients including Flo-Rida, Gloria Estefan, Julio Iglesias and KC and the Sunshine Band. That’s because stars in the music, TV and film industries appreciate his legal skills and experience. Today, Bercuson is one of the most highly recognized attorneys practicing entertainment law in Florida. His diverse client list includes U.S. and international music labels, artists, as well as South Florida television personalities like Cristina Saralegui, Jim Berry, Eliott Rodriguez, Ambrosio Hernandez and Adamari Lopez. Known as a tenacious advocate for his clients, Bercuson is also experienced in domestic and foreign music licensing and obtaining recording or publishing deals for artists. In 1998, he was instrumental in bringing MIDEM, the world’s most important music conference and market, to Miami for three consecutive years. Born in Chicago, Bercuson moved to South Florida at age 11. He earned a bachelor’s degree at Tulane University and his law degree at the University of Florida. He recently celebrated his 44th wedding anniversary with his wife Marla, who is director of business operations at the University of Miami’s Bascom Palmer Eye Institute. They have two daughters and six grandchildren. Bercuson’s timing couldn’t have been better. At this same time, CBS had just moved its Latin American music operation from Mexico to Coral Gables on the same floor as his law office. Soon, Bercuson was representing Disco CBS (which became Sony Music Entertainment US Latin LLC) with litigation matters and negotiating contracts for artists and producers. He also gained experience in licensing arrangements with music publishers, broadcasters and other organizations around the world. Soon, Bercuson was representing Spanish-language artists and TV talent, followed by English-language performers, TV anchors and sportscasters. Several years later, Disco CBS was sold, but by then Bercuson was already well established in his own practice. While Bercuson usually represents individual artists, he also helps composers, independent labels, producers and publishers, staying active in all aspects of the entertainment industry. “I am not an agent or manager for my clients; I do their legal transactional work,” he says. A typical day for Bercuson might include negotiating a new recording, publishing or sponsorship deal for an artist, negotiating a contract for a TV news anchor, reviewing an endorsement contract for a top recording artist, or representing the mother of a young singer being courted by a U.S. record label. He has also handled some types of arbitration and litigation matters, such as a programming dispute between two TV companies one from the United States and the other from Argentina. To help his clients collect royalties in other countries, Bercuson is an expert in “neighboring rights;” a source of income derived from public performances on the radio. Under the 1960 Treaty of Rome, artists and labels split the revenue derived from radio airplay — a concept called neighboring rights. “Because the U.S. didn’t sign that treaty, collection of these monies can be arduous,” he says.